Keep your feet warm and toasty! Almost a year ago I made myself a pair of Samantha women’s shoes from ithinksew. To say that those are my most worn self-mades is probably an understatement. I’ve worn them every single day when I was at home, except when I was in the shower or in bed. 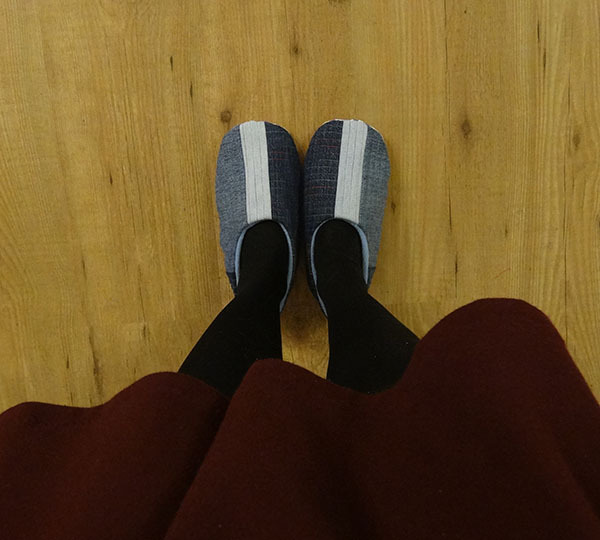 They’re not the most elegant footwear but they are comfortable and warm and that’s exactly what I want when I’m at home. Not so surprisingly, the lining of that pair is wearing out and they’ve gotten a little dirty. Time for a new pair! I made exactly the same size as last time. This time I used the quilt as you go method to make the outside using Hobbs 80/20 batting, denim scraps (from old pairs of jeans, yay for recycling!) and Güttermann Sulky variegated thread. For the lining I used a thick polar fleece. 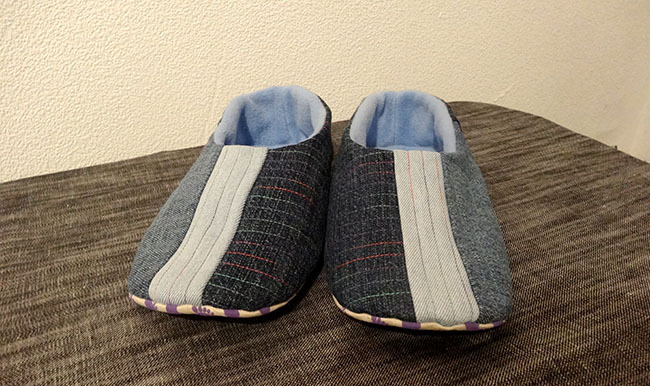 The sole is again made from slipper gripper fabric. I can highly recommend this product. I haven’t slipped once wearing my old pair. When I was quilting the outside I wasn’t so sure I would like the final product but I’m quite pleased with how the patchwork and variegated thread looks on these shoes. I’m sure they’ll get worn just as much as the old pair. I think I have a new love. Last weekend we went away and I decided somewhat last minute that I wanted to take something with me to craft. 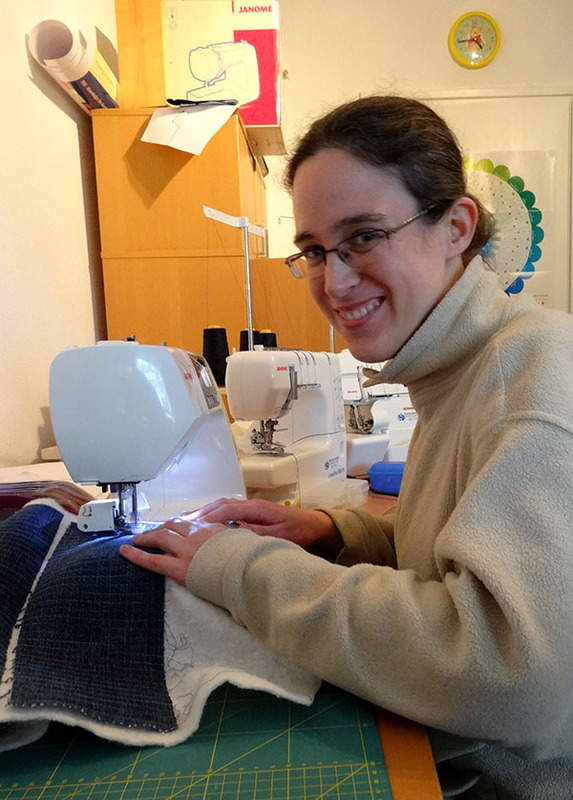 I’ve seen many bloggers take English paper piecing projects with them when they travel because it’s portable and doesn’t require a lot of tools. 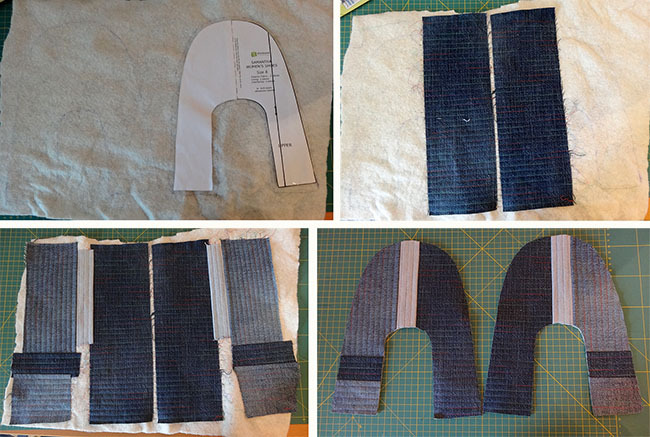 I always thought English paper piecing would be very complicated and difficult but I had never looked into the details of how exactly it’s done. A couple of YouTube videos convinced me that it is in fact extremely easy as long as you work accurately. 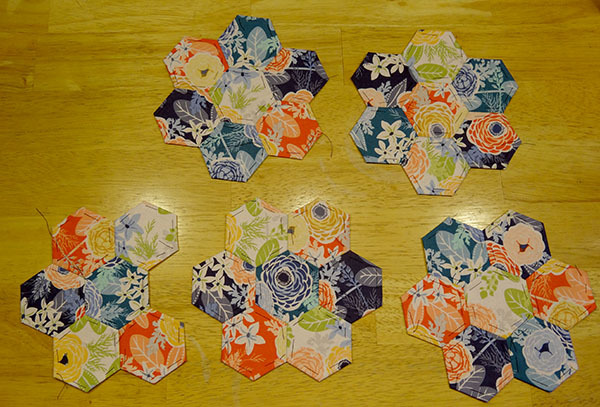 Within an hour I had printed several sheets with hexagon templates from My Poppet and cut a stack of fabric squares to take with me. 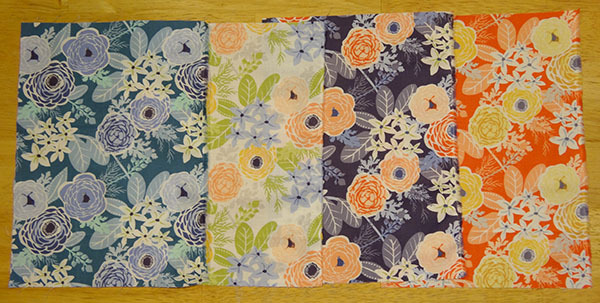 I chose four fabrics from the Sunnyside collection that I didn’t use for the babyquilt because they had flowers on them. The print is the same for each fabric but they’re in a different colourway. The white one reminds me of old fashioned curtains and tablecloths but cut up into smaller pieces this association luckily disappeared. I decided to start simple and assemble hexagon flowers with one of the fabrics in the centre and the other 3 in a circle around it. All I needed to take with me was a plastic thingy (that probably has another official name in English) that at first held the sheets with printed templates and that I later used to store assembled hexagon flowers (a very nice discovery that those fit in there!). 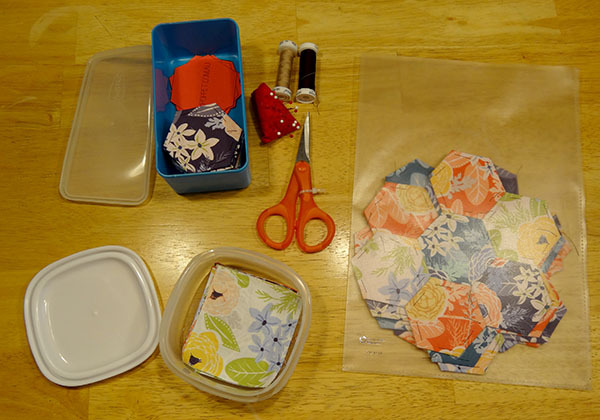 Two small containers held my precut fabric squares and my cut templates and fabric covered templates. 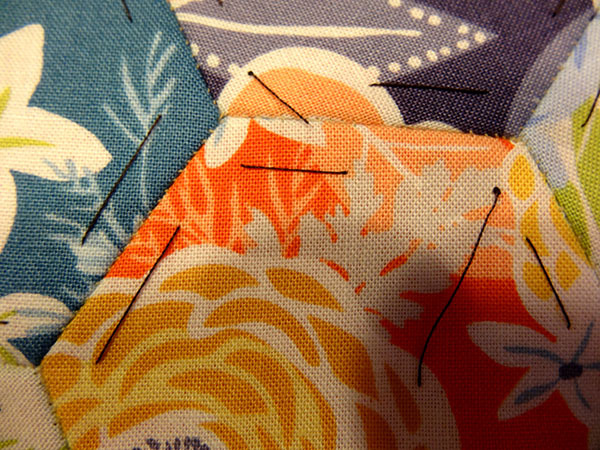 Lastly, I brought some pins and needles in a small pincushion, a pair of scissors and two spools of thread. During the weekend I assembled almost 5 flowers! I was amazed at how fast they came together for something that is made completely by hand. What I also like about it is that it’s actually so easy that I can still do it when I’m relatively tired and other crafting projects aren’t an option. This might change when I try more complicated projects with differently shaped pieces or attempt fussy cutting. The remaining fabric has already been cut into squares and I am ready to assemble some more flowers. I’m not really sure what I am actually going to do with them because my spur of the moment decision to try English paper piecing didn’t really involve much more than “let’s give it a try and we’ll see how I like it”. Assemble into larger pieces to make a very small quilt or keep them separate and applique on pillows? 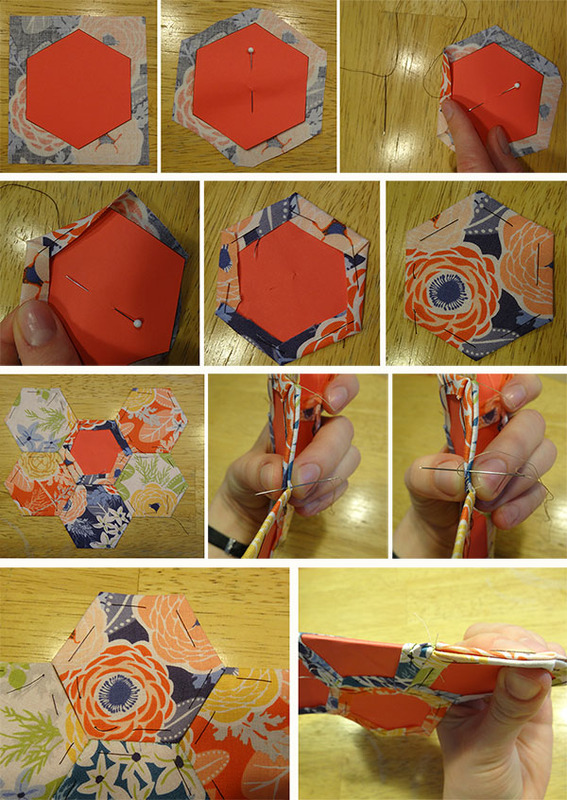 I also already have quite a number of ideas for other paper pieced projects. Where can I get more time?